I’m a big fan of OSSEC. This tools is an open source HIDS and log management tool. Although often considered as the "SIEM of the poor", it integrates a lot of interesting features and is fully configurable to solve many of your use cases. All my infrastructure is monitored by OSSEC for years. One of the OSSEC feature that I like most if the FIM module or “File Integrity Monitoring”. It allows you to report any change to directories or files. This is an excellent way to detect suspicious changes in your web server directory. 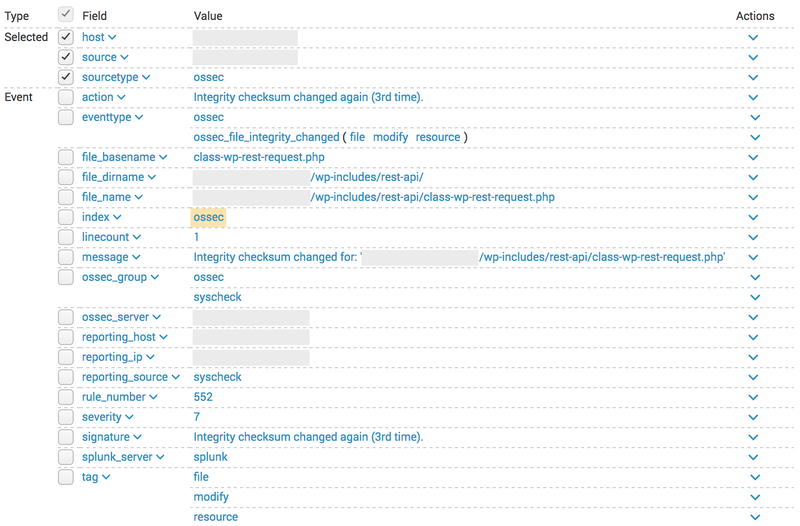 If a change is detected on your index page, it’s time to create an incident and investigate! Another security feature that is available in more and more applications: automatic updates. No need to apply security patches, the system or application will apply patches when they are released. (Note: This technique as pro and con but, in most cases, it helps to reduce the surface attack of your applications). If you combine automatic updates with file integrity management, you can sometimes spot interesting stuff. Here is an interesting example. >        * Get the user, if the ID is valid. >        * @param int $id Supplied ID. >        * @return WP_User|WP_Error True if ID is valid, WP_Error otherwise. A few days later, when Sucuri released all the details about the vulnerability, it was clear that Wordpress silently released a patch that was installed by all servers configured to do it automatically.